Can-Am Maverick 1000 Radiator Relocation Kit w/ Silver Screen FREE SHIPPING! Can-Am Maverick 1000 (ALL Years) Radiator Relocation Kit w/ Screen (Red) $240.00 FREE SHIPPING! Can-Am Maverick 1000 (ALL Years) Radiator Relocation Kit w/ Screen (Red) $249.00 FREE SHIPPING! 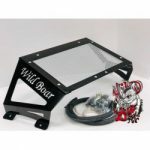 Can-Am Maverick 1000 (ALL Years) Radiator Relocation Kit w/ Screen (Silver) $240.00 FREE SHIPPING! Can-Am Maverick 1000 (ALL Years) Radiator Relocation Kit w/ Screen (Red) $240.00 FREE SHIPPING! !